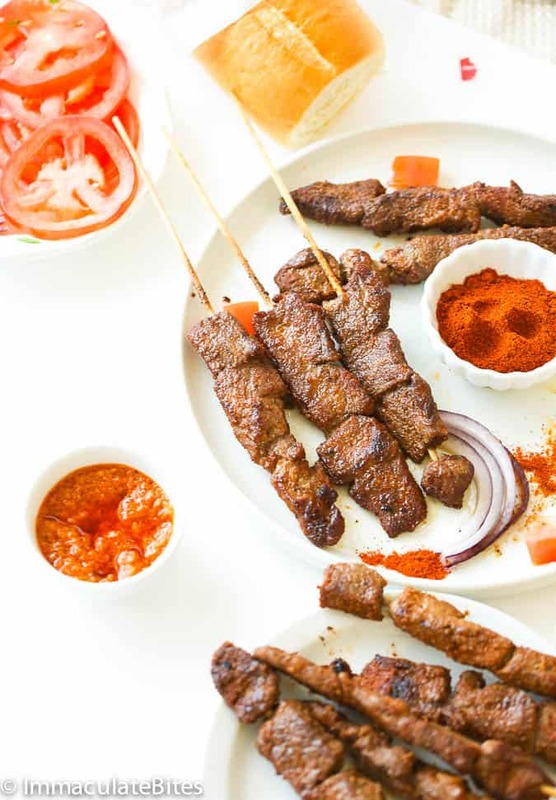 Suya- Roast African spicy skewered beef – An irresistible beef Satay with Spicy Peanut Spice Blend – the epitome of West African Street food. 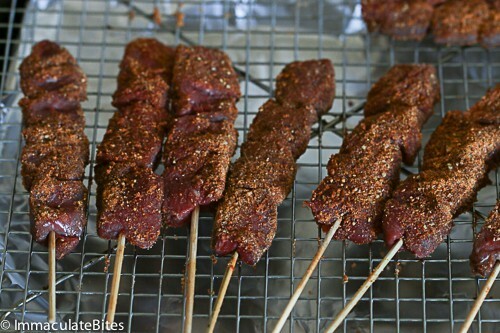 There is something about suya that makes me, well hungry. 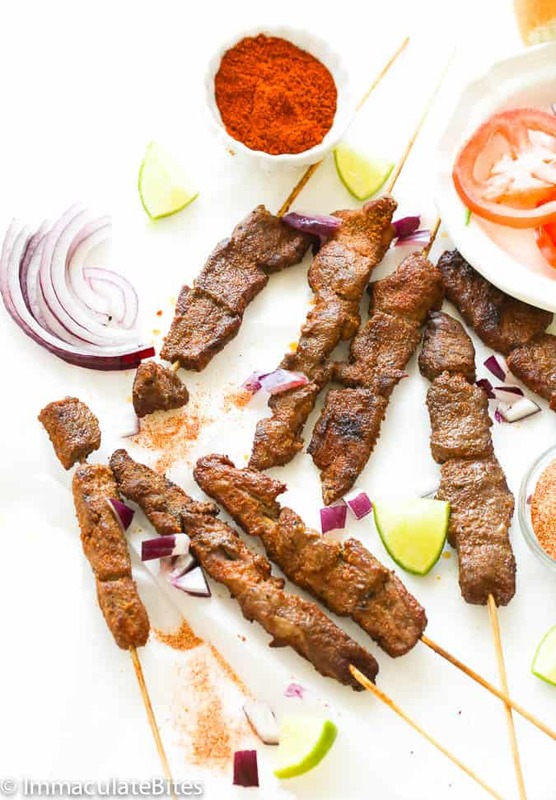 It doesn’t matter what suya comes to mind- liver, tripe, fiery hot , spicy; The thoughts of food linger on for hours . I don’t think I can get enough of eating or thinking about it. 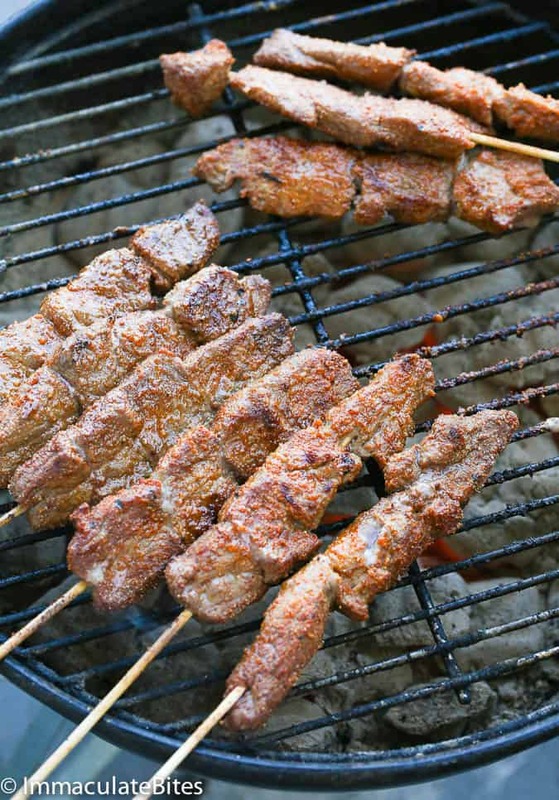 Unless you have been crawl up under a rock, there is no denying you must have tried some form of skewered meat that is grill, broil or slowly cook over an open flame. 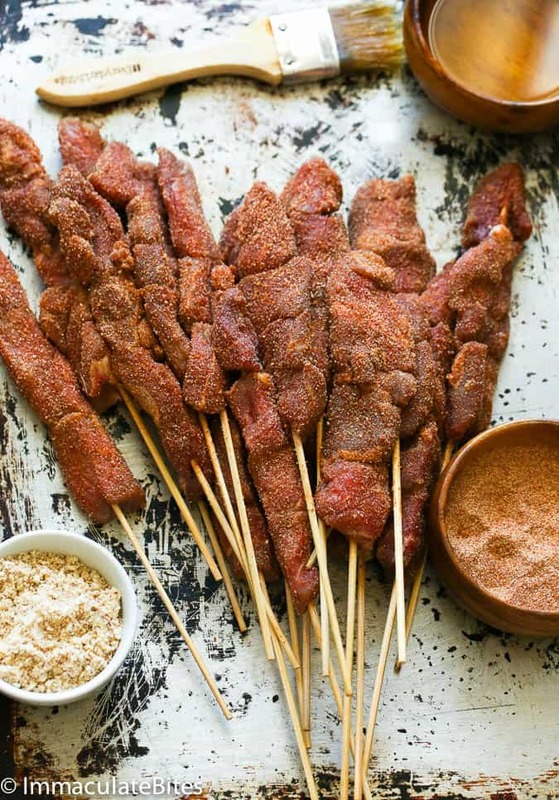 Suya is the word use to describe this skewered meat in Africa, particularly in Nigeria and Cameroon. It mostly originated from the Hausa people, one of the largest ethnic groups in West Africa. They would set up their Bbq pits in most neighborhoods , on street corners ,selling grill meat , some skewered others not, till every single stick is gone. 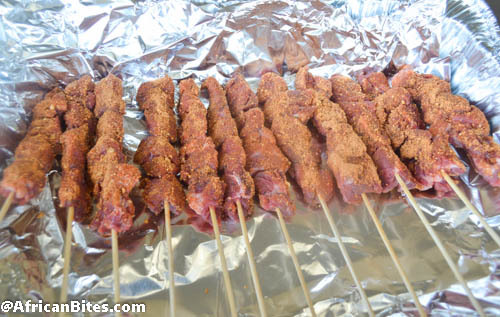 Suya is the single most popular street food that most West Africans look forward to eating, as they travel back home. 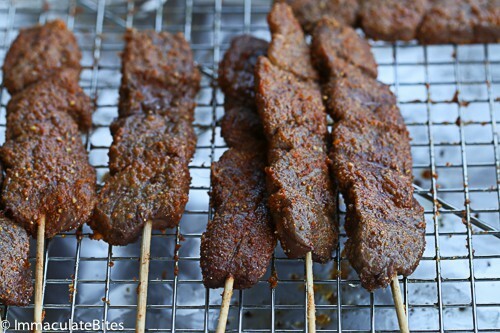 My journey is never complete without countless sticks of suya, piping hot, just off the grill. 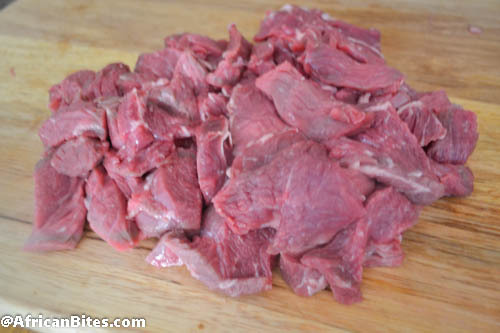 There are several ways of making suya, the key ingredient in suya is good quality meat. I experiment a lot, using whatever cut I can get a good deal on at the market, and I use mostly sirloin , chuck roast and ribeye roast. You need meat that is tender, fatty, and beefy and easy to cut into uniform shapes. 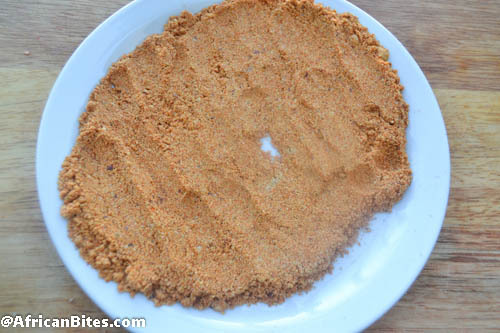 In this recipe, ground peanut is mixed with garlic, onion powder, cayenne, smoked paprika, chicken bouillon powder, white, and hot pepper. The ground peanuts add an authentic taste and an unmistakable flavor to the spicy blend and that is what makes it uniquely African and of course the fiery pepper add a spicy kick to this street food. You may omit the extra hot pepper. Serve warm or at room temperature with onions, tomatoes . 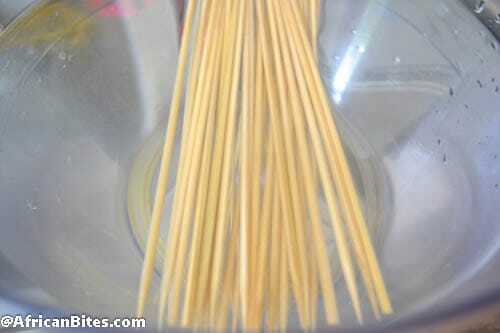 Soak the skewers for at least 20 minutes totally submerged in water before using it to prevent burns. 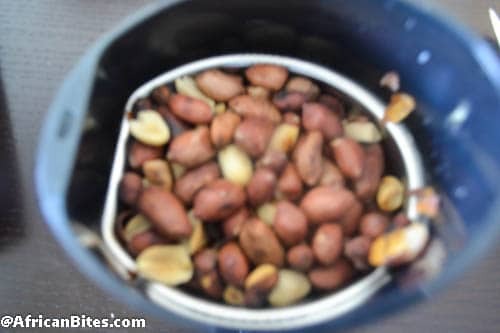 Peel roasted peanuts, and then grind in a coffee grinder with skin on, until finely crushed. Do not grind the peanuts into paste. 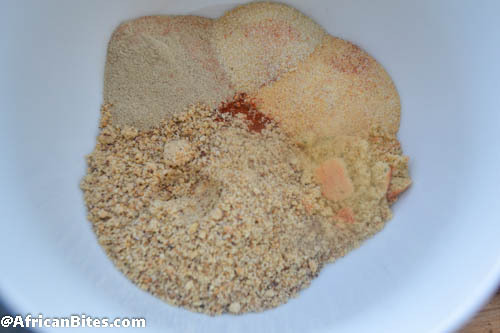 Add the ground peanuts into spice mixture. 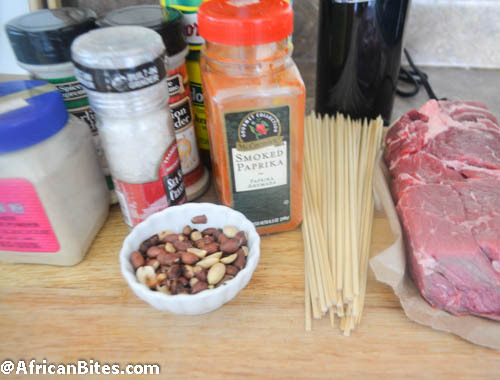 Rub the steak skewer with spice mixture; on both sides. Line a roasting or baking sheet with foil paper. 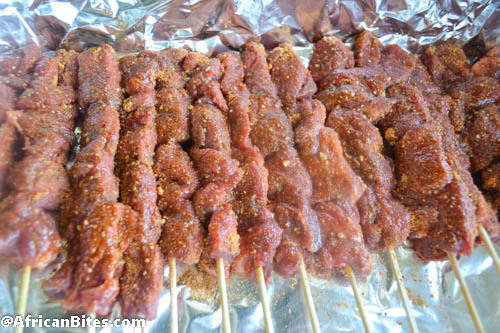 Place skewers on cookie sheet , then place on the roasting pan or baking sheet. Drizzle with oil and bake on for about 12-15 minutes. Optional -Towards the last 3 minutes of baking switch from baking to broiler setting. To get a nice crisp brown on the outside. I experiment a lot, using whatever cut I can get a good deal on at the market, and I use mostly sirloin , chuck roast and ribeye roast. You need meat that is tender, fatty, and beefy and easy to cut into uniform shapes. 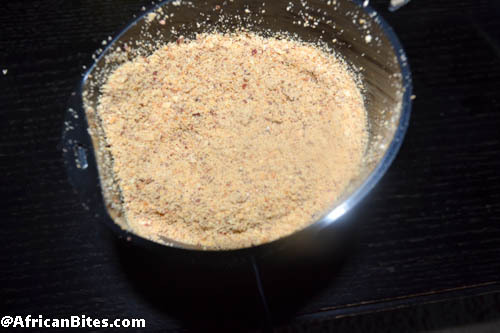 In this recipe, ground peanut is mixed with garlic, onion powder, cayenne, smoked paprika, chicken bouillon powder, white, and hot pepper. 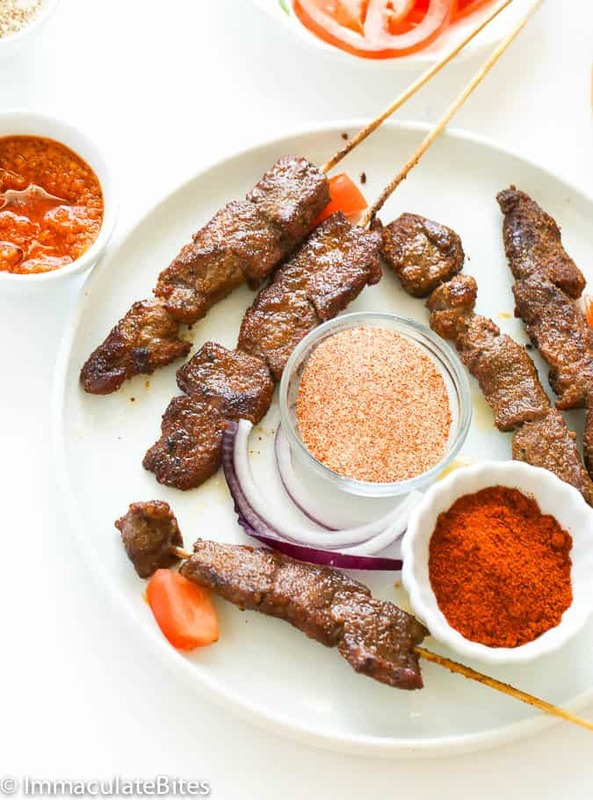 Recipe update – cooking time was reduced from 20 minutes to 15 minutes to produce a juicy and tender suya. Made them this evening. For the kiddos it was too hot, but for the adults we enjoyed the heat and savory flavor. Brought back a few memories of my peace corps life in Benin. Going to repeat this with less spice for the kids and regular recipe for us. so happy to hear it was tasty. Less heat would definitely make it more bearable for kids. Thanks for letting me know. Did you flip the skewers halfway through? Wonderful article! We will be linking to thgis particularly great article on our website. Thanks alot i will try this. 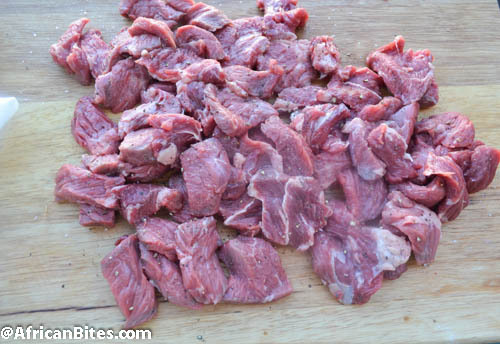 can i use goat/ram/lamb meat? can i use chicken meat? and how thin should i cut the meat. Not too thin. If you like them moist then cut them a little thick. Any meat will do just fine. Awesome! Do let me know how it works out for you. Thanks ! Thank you for this delicious recipe! 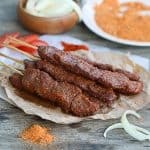 When I ate suya at the market in Cameroon we dipped our meat into an additional spice blend when we removed it from the fire to eat. I think there were actually two – one more mild and peppery and the other more spicy. Do you know what would typically be in those types of spice blend? I’m trying to figure out if it is the same set of spices as the suya marinade (pepper, onion, garlic) just without peanut. I love your site! Thank you again! Hi. I want to start the grill up soon. I have one question as I want to try to make this, but my Liberian friend puts on a gravy like sauce. Any ideas what grill marinade that could be? Thanks for the great recipes when my mother in-law can’t cook for me I still need my fix lol. Hi Vicky! There are so many different sauce or marinades that you can use. You should make your own marinade with spices that you like- garlic, ginger, soy sauce, chili pepper, onions and herbs. Blend and go from there. I don’t see why not since you are going to grilling it. I usually just skewer the beef , refrigerate . When ready I marinate the beef then grill. Let me know how it works out! Thanks for the reply. Will let you know how it turns out. Hi, I marinated the beef the night before my “African potlock” and added the ground peanuts to it the next day. Mine turned out a little dry but still had a lot of flavor. 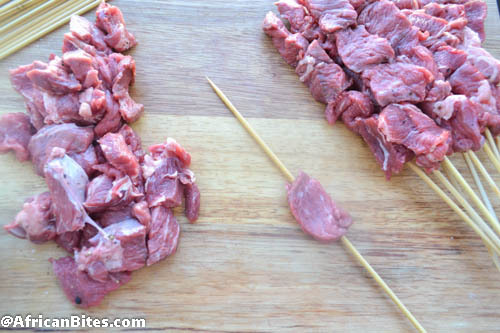 I found that it takes less time to marinate than it does to add the beef to the skewers so the next time I cook for a large quantity, I will probably skewer the beef the night before and marinate the next day. Thanks for the feedback Jeannette. If you want juicy suya. 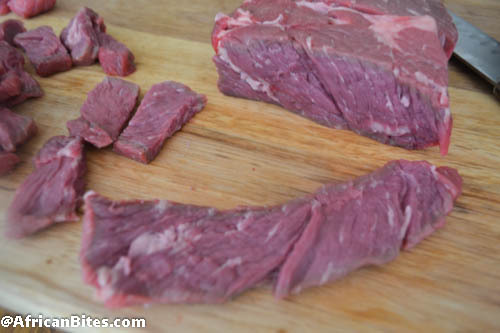 Do not over cook it – cut cooking time and pick a a well marbled beef. Yes, you can freeze and reheat until it is warm enough to it. Hi Frida, Sorry I don’t live around that area. Fantastic. It takes very little time to make and doesn’t take much effort. Watch out, i t’s pretty spicy! Mmm, sounds awesome. Shall try this soon! Sam, Let me know how it works for you! What is the hot pepper you use in this recipe? Is there a specific brand you use? Thanks. No, you can use cayenne pepper. 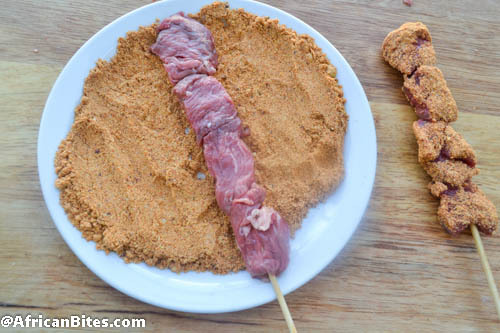 I have never made suya with kuli kuli before. What a great idea.Let me know how you like them. Thanks for taking the time to comment. My husband ate most part of it. Thank you.